A 5 inch Megalodon tooth found in South Carolina with a natural marine borehole in the root turned into some real Megalodon bling. You too can wear a real fossil tooth of the most badass predator in Earth's history. Reaching up to 60 feet in length, this massive, extinct Megalodon Shark was the largest predator in the history of our planet. 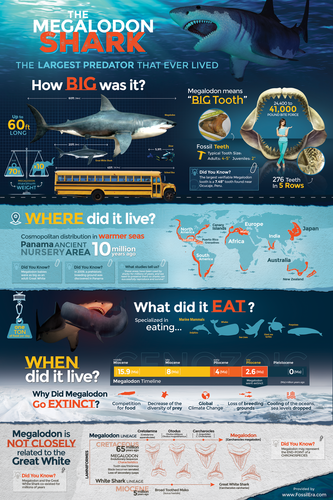 What is more awe inspiring that a shark that ate giant whales for breakfast? MegalodonSwag.com is dedicated to providing information, news and highlighting cool products related to the Megalodon.